A critical aspect of the Mental Construction view of mental life is handling of incomplete or partial data. That affects perception, worldview, memory, and decision-making. A theoretical argument of how neural thresholds, distinctive All-or-None firing, and Hebb’s Law give rise to the Almost Gate which results in partial data, in the right conditions, having the same result as fuller data. For more, Induction – Conscious Intuition and Intuition by Matching. Let’s take partial pattern completion from theory to observation. Gestalt principles were first introduced in the early 1900s to explain aspects of perception. These principles were a reaction against reductionism, against the idea that all understanding results from isolating parts a phenomenon and studying that part in isolation. Gestalt is based on the idea that something essential is lost in focusing on individual parts in isolation. Something new emerges when all the components of the situation, phenomenon, sensory input, idea, or concept are considered in toto. In Mental Construction theory, these principles explain how similar, but not exact or complete data, is treated as if there was a complete match. There is much theorizing by believers in Gestalt that has not stood the test of time, but its basic principles about how we organize perceptual information into groups have. Proximity. This Gestalt principle states that objects close to one another will appear as groups. In Figure 1, three columns of dots, a missing column, then two more columns are perceived. We group them automatically rather than perceived them merely as a individual dots. The received data is given a structure by the visual system and occipital lobe. It has imposed a larger order on the input data. Closure. Do you see the square and circle or do you see two dashed lines in Figure 2? Probably you see both, yet you can’t help but consider them as a square and a circle. Why is that? The closure grouping principle captures our preference for complete shapes. This is true even if the shape is partial hidden, as when we see a table partly obscured by chairs, plates, and a centerpiece. Similarity. 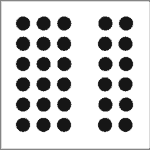 In Figure 3, the alternating rows of black dots and unfilled dots leap to our attention as distinct rows. That internal similarity completely overshadows the potential columnar organization. As in all the Gestalt or grouping principles, the examples show action over an area of information. 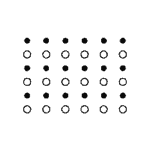 The individual dots are assumed to be perfectly sensed. It is the arrangement into groups that occurs. In Maps in the Brain there is a good example of the letter ‘E’ being recognized despite a misplaced central bar. In Figure 4, You see a straight line intersected with a curved line. 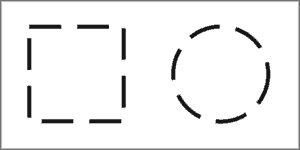 You do not see a short straight segment connected to a curve segment swooping up and another line starting as a curve then changing to a straight line. 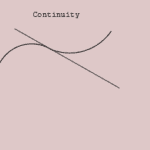 Continuity grouping means that we treat inputs as if they do not change abruptly. Common Movement. Items that move together are grouped together. 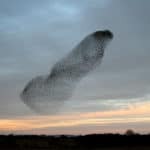 Example, birds moving together are considered a flock which has general characters that no particular bird does. When grouping by common movement we are creating a higher level concept. That occurs in our brains, not just at the perceptual enhancement level, but as the situation we find ourselves is further considered in light of our memories, our knowledge, and our desires. An especially compelling instance of Gestalt principles in action is watching a movie. We are presented with a sequence of suitably arranged still images. With no particular mental effort, we see motion. We can consider the input data as partial and we add the motion component to complete the image or, conversely, we could consider the input as complete and the motion as an emergent quality. In a similar fashion, it’s sensible to label some input data as partial because the data is partial at a higher concept level. Association of concepts refers to the observed relationship we place on ideas, patterns, situations, or concepts that causes their observation to cause the associated concept to arise. More on association at the Many Faces of Induction. As our perceptions move towards conscious consideration, the data is augmented by alignment with memories, knowledge, desires and fears. At each step along the way, input data comes from multiple directions and is grouped by principles akin to those of Gestalt into new concepts related but not identical to the raw input perceptions. The similarity between Gestalt and Association principles is striking, but less surprising if you consider that they are both naming phenomena which have the same root, just working of different layers of abstraction. In the past century, Gestalt psychologists have documented many instances that support the basic grouping principles, which detail many of the ways in which the human mind completes partial data and permits the interpretation that those principles support matching higher level concepts.